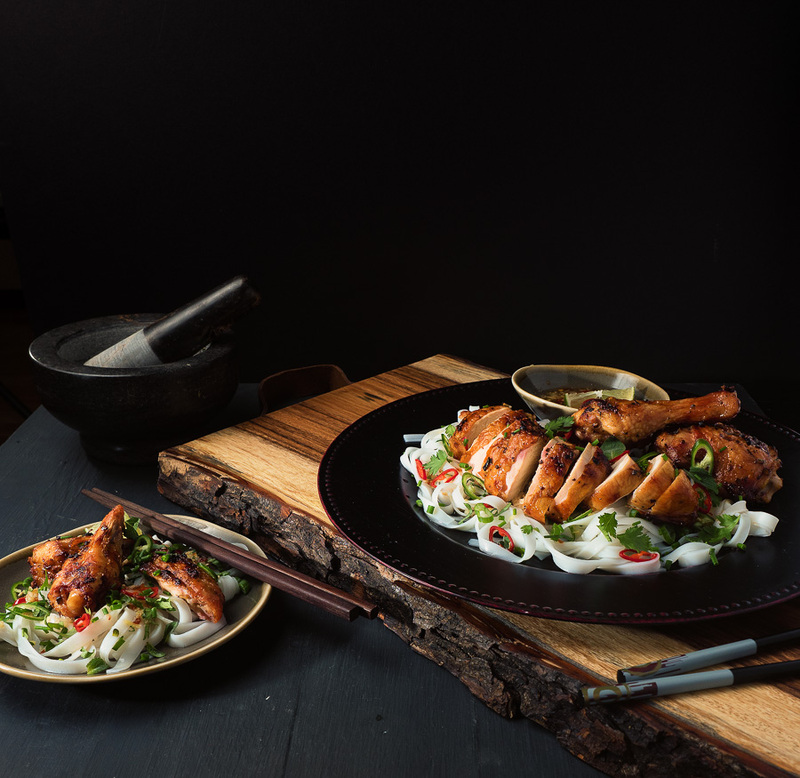 Vietnamese grilled chicken is loaded with big south east Asian flavours. Citrus. Ginger. Chili. And the kiss of smoke. Delicious. Sometimes you need to shake things up. Grilled chicken can be a trap. You get into a rut – making the same 3 dishes over and over. 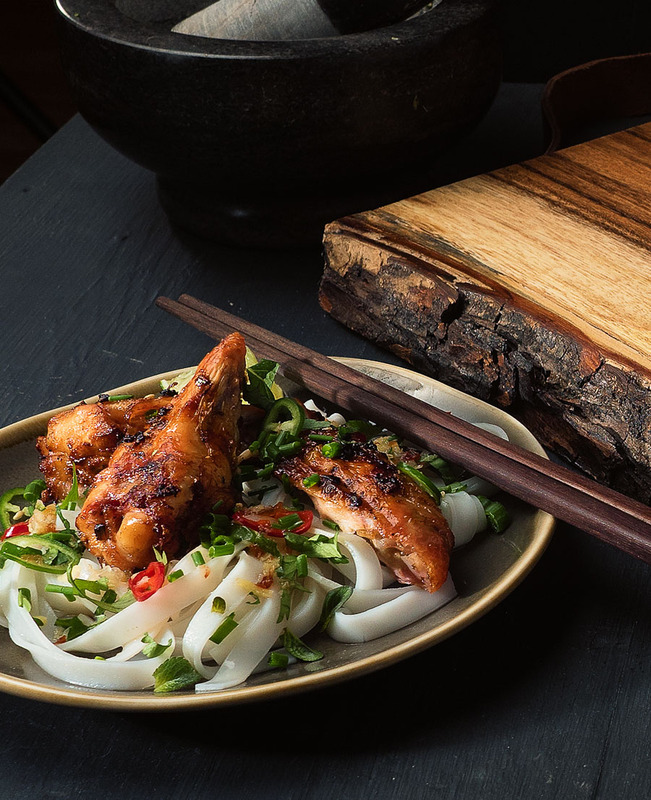 If you’re stuck there, Vietnamese grilled chicken is for you. Bright citrusy flavours. A bit of smoke. A hint of chili. The tang of ginger. It all comes together in this dish. 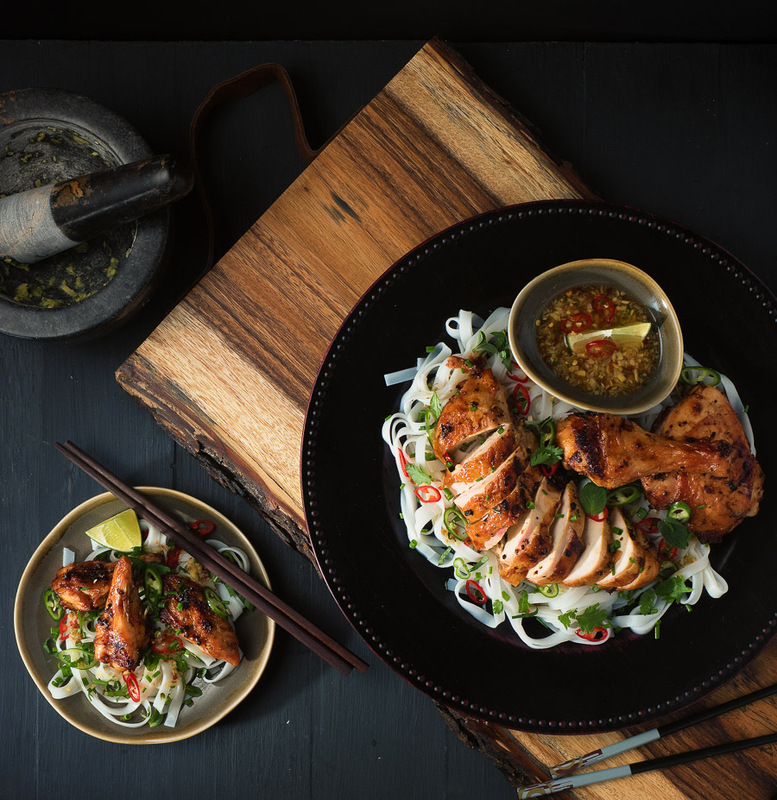 Vietnamese grilled chicken is a great way to bust out of your grilled chicken funk with a bang. I’m a charcoal fan. I am actually a huge charcoal fan. Don’t own a gas barbecue. Haven’t for years. A decade. Maybe longer. Charcoal adds a flavour that gas barbecues just can’t. Smouldering wood chips over propane is not the same thing as charcoal. If you don’t believe me you haven’t had anything cooked over charcoal in a while. If you are in the market for a new grill I urge you to try something like a weber kettle. It costs less than all but the cheapest gas grill and it will last a lifetime. Good value IMO. Great flavour too. Vietnamese grilled chicken is great over charcoal. I’m sure it will work over gas – but I don’t think it will be quite as good. Sorry. Don’t let that stop you though. It will still be better than chicken and barbecue sauce. 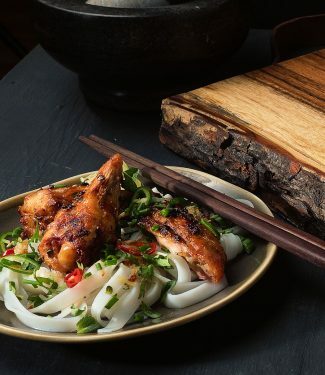 This recipe is adapted for grilling from a couple chicken recipes in May Pham’s The Best of Vietnamese and Thai Cooking. That book is a little jewel. Worth seeking out in second hand book stores. The ginger lime dipping sauce is pretty close to the hers as well. The noodle salad is all me. Serve it up plated individually or family style. It’s a perfect dish to share at the table. The noodles are a bit slippery but that’s part of the fun. You could also serve this as a great small plate in a bigger menu. Couple bites of noodles with a bit of chicken on top. If you’re doing it small plate style think about boneless, skin-on thighs or breasts cut into smaller pieces. This Vietnamese grilled chicken may not be on any Vietnamese restaurant menus yet. But if should be. Vietnamese grilled chicken is a great change to the usual suspects when grilling chicken. Leaving the skin on the chicken adds that extra kick of flavour. Joint the chicken. Quarter the chicken, removing the back. Separate the thighs from the drumsticks. Remove the wings from the breasts. Cut each breast into 3 roughly equal pieces. You should have 12 pieces of chicken. Combine the marinade ingredients. In a large bowl, toss the chicken in the marinade. Marinate for no more than 2 hours. Lemon is an acid. It "cooks" the chicken and can result in a mushy texture. Chop the ginger, green chili and garlic as finely as you can. If you have a morter and pestle, grind them together. Add the remaining dipping sauce ingredients and stir thoroughly to dissolve the sugar. Let stand about 1 hour before using. Remove the chicken from marinade. If using a gas grill, set it up for high indirect heat. Place a drip pan under the grill on the cool side. Grill the chicken over the dripping pan for about 25 minutes. Move the chicken over high heat briefly to add grill marks if desired. If using a charcoal grill, bank the charcoal on both sides and place a drip pan in the middle. Grill the chicken over the drip pan for about 25 minutes. Move it over the charcoal carefully to add grill marks. Soak the noodles in hot water for 40-45 minutes to soften. Do not boil them. Please. Heat the oil in a wok or large pan. Add the noodles and stir fry until they soften. Remove the pan from heat. Add 1/3 cup ginger lime dipping sauce. Stir briefly and add the green onion, red pepper and green chili. Alternately you can serve this with a cool noodle salad. You need to cook the noodles first. A soak won't quite do it. Then toss the noodles with the green onion and the peppers. Drizzle with the dipping sauce and a bit of the herbs and peanuts. Works great either way. Mix it up. It will be fine. Spread the noodle mixture on a plate. Sprinkle with cilantro, mint and peanuts - or whatever you feel like. Top with the grilled chicken and drizzle the ginger lime sauce overtop. Serve additional dipping sauce on the side. The dipping sauce will keep in the fridge for a week or two. In bbq and grilling, main course, noodles, poultry, vietnamese. Bookmark the permalink. Huge charcoal fan here, too! We haven’t used a gas grill in years. :) This recipe looks so flavorful and delicious, and I can think of so many things that dipping sauce would go well with. Definitely pinning this for barbecue season! We had a little warm snap so I dug a path in the snow to get to my BBQ to make this. Had a little burst of charcoal goodness to tide me over until spring comes. I often fall into a grilled chicken funk, so this looks like a great way to try something new! I really enjoy Thai flavors – the marinade looks super flavorful and it seems like grilling would really bring out some depth in that. Unfortunately, I don’t have a charcoal grill – I’ve always been too impatient. You have me reconsidering…but for now, I’ll give this a try knowing it might lack that certain something. Alison, if you have a friend with a charcoal BBQ have them make something for you to see for yourself. That’s how I started. I had some chicken cooked over lump charcoal one Saturday many years ago. Sunday I owned a charcoal grill of my own. After a few months of never even turning my gas BBQ on I sold it and never looked back. We’re charcoal-only fans big-time. No store-bought briquets, either, just The Real Deal. This recipe looks fantastic. Ginger isn’t used nearly enough IMHO. In case you can’t find real lemongrass, some stores carry tubes of lemongrass paste — not as good as the real thing, but an acceptable sub if needed. May have to see if we can grow lemongrass …. anyway Grilling Season will officially open in SE Idaho in about two weeks. YAY. I totally agree. It’s the real deal lump charcoal for me all the way. Thanks for the tip on the lemongrass paste. I did not know that. Hopefully I’m about two weeks away from grilling season up here in Canada too! This is so perfect! I often resort back to the same old grilled chicken or BBQ chicken, the flavors in your Vietnamese grilled chicken sound amazing! I also prefer charcoal to gas, but lately I’ve been using my Traegar just for the ease and last-minute planning. I’ve got to get my good old Weber out again, thanks for inspiring me! Wood pellets on a Traeger is also fine and by default you have the indirect heat so that’s good compromise until you can dig out your Weber. My go-to meal at my favourite local Vietnamese restaurant is lemongrass grilled chicken with noodles! This chicken looks even better! Super flavourful especially with the ginger-lime dipping sauce. Thanks for sharing! I’ll do a Mexican grilled chicken soon to help poor Terry out – LOL. Try a little hibachi in the fireplace if you have an old school wood burning fireplace. That’s what I do in the winter to get my fix.